All machineguns mentioned below and also Czechoslovak rifle ZB model 24 used widely by Czechoslovak army in 1938 were constructed for use of unified ammunition calibre 7.92mm (Mauser). 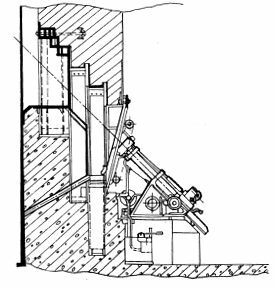 Heavy machineguns models 7/24 and 24 were used only in light pillboxes of both types 36 and 37. This gun was watercooled. Model 7/24 is Austrian Schwarzlosse machinegun rebuilt for calibre 7.92mm, model 24 was newly produced. Light machinegun ZB model 26 was modern infantry machinegun which led e.g. to licenced production of BREN machinegun in England. It was used either as main gun in small pillboxes (both types) or as gun for close defence in heavy casemates. 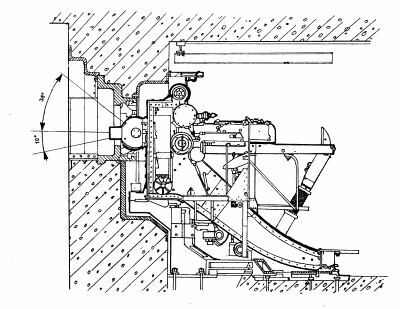 This is main machinegun type for heavy casemates, although they were sometimes (where long distance firing would be benefit) used also inside light pillboxes. 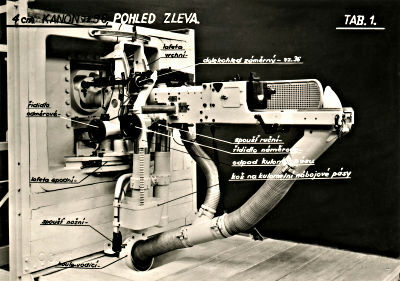 Three configurations were used for heavy fortifications: single (codename "D"), double (codename "M") and mixed gun with anti-tank cannon Skoda model 36 (codename of this mixed gun was "L1"). Anti-tank gun constructed especially for use in fortifications. This self-loading weapon of calibre 47mm could fire up to 40 shots per minute. It's installations in casemates begun in 1937. There were produced 268 these guns until September 1938. In most cases it was installed together with heavy machinegun ZB model 37 and such a mixed gun was given codename L1 . 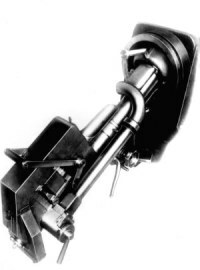 Cannon without machinegun was codenamed "Q". During WWII it was widely used by Germans at their fortifications like Atlantic Wall and Siegfried line (West Wall). Germans called it PaK 36(t). Only few guns remained in the Czechoslovakia. Unfortunatelly these were scrapped in 1960's. In the Czech Republic you can see it now only in casemates N-S 82, K-S 5 and MO-S 19 or in Military Museum in Prague. This gun was planned for use in artillery casemates and retractable turrets (where two these guns were to be used). It should have been main (and the only) artillery gun for Czechoslovak fortifications. However, no gun had been installed until end of 1938. First of them should have come in Spring 1939, so in September 1938 they were substituted by 75 field howitzers installed in front of casemates. Similar situation was regarding artillery turrets - none of them was installed in 1938. First installation was planned for 1939. During WWII, one of these turrets was tested somewhere in Germany.